Calculations at a spheroid (ellipsoid of revolution). 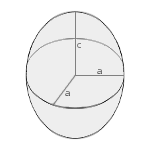 A spheroid is an ellipsoid with two semi axes of equal length. 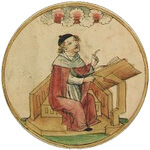 There are two forms: the oblate spheroid with a>c, this is the form of stars and planets. With a<c, it is a prolate spheroid, like an American football or rugby ball. 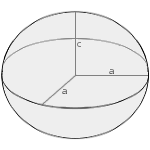 With a=c, it is a sphere. Enter the semi axes a and c, choose the number of decimal places and click Calculate. The semi axes have the same unit (e.g. meter), the area has this unit squared (e.g. square meter), the volume has this unit to the power of three (e.g. cubic meter). A/V has this unit -1. Ellipticity is dimensionless.